Rosa Rubicondior: Creationism's Nightmare - Abiogenesis! Haematite tubes from the NSB hydrothermal vent deposits that represent the oldest microfossils and evidence for life on Earth. The remains are at least 3,770 million years old. Science is moving closer to an explanation of a process whereby the earliest proto-cells could have developed naturally on Earth. It's looking increasingly as though the best explanation of where suitable conditions could be found - in the rock precipitates around hydrothermal vents on ocean floors - is the right one. It's also looking as though the process got going even earlier than we thought - when Earth was just few million years old, if the interpretation of the evidence presented in this paper is correct. It is strongly suggestive that the process may have got going at least 3.77 billion and maybe even 4.28 billion years ago. 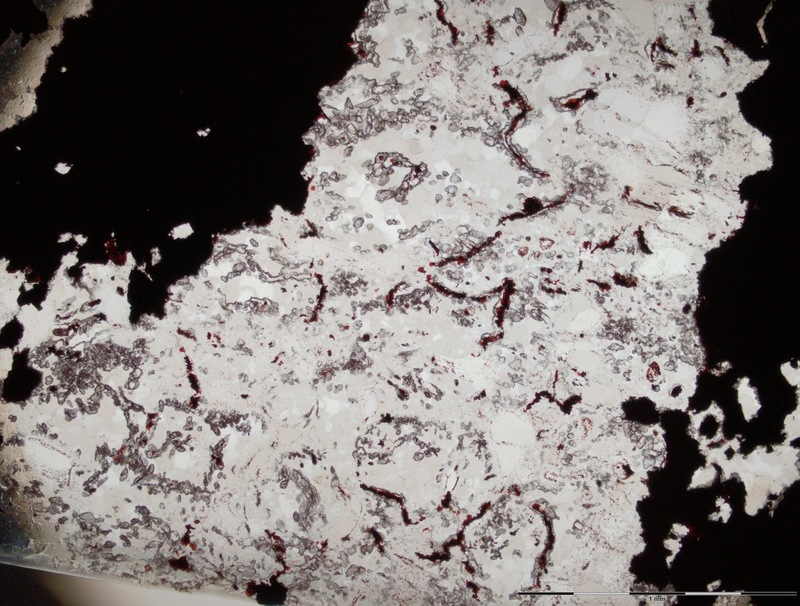 The evidence was found in rocks from the Nuvvuagittuq belt in Quebec, Canada, which are believed to have been formed by precipitation around seafloor-hydrothermal vents. 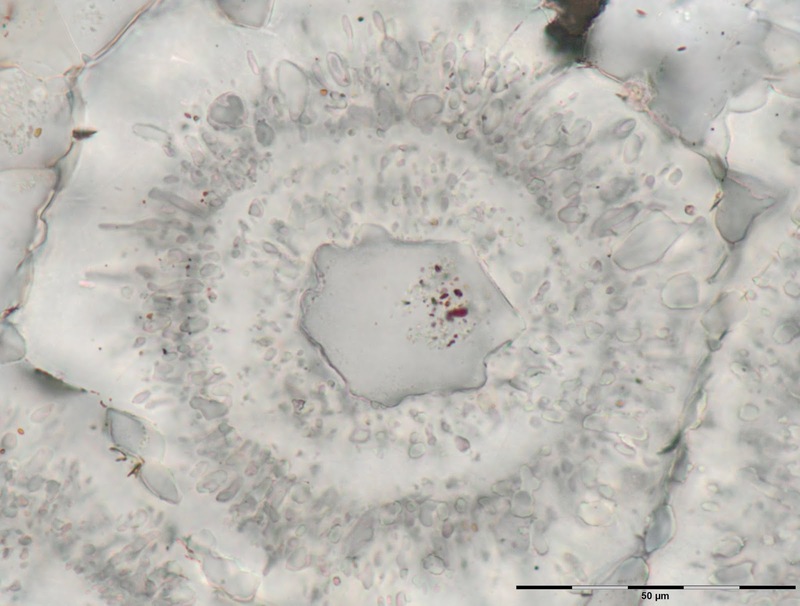 Microscopic iron-carbonate (white) rosette with concentric layers of quartz inclusions (grey) and a core of a single quartz crystal with tiny (nanoscopic) inclusions of red hematite from the Nuvvuagittuq Supracrustal Belt in Québec, Canada. These may have formed through the oxidation of organic matter derived from microbes living around vents. The scientific significance of this discovery, apart from the age of the fossils, is that it suggests life developed on Earth at a time when both Earth and Mars had liquid water on their surfaces so the same process might well have occurred on Mars. If not, it suggests there was something special about Earth at that time. The researchers systematically eliminated all the possible natural ways the filaments and microtubules made of haematite could have been made by non-biological means such as pressure and temperature changes. 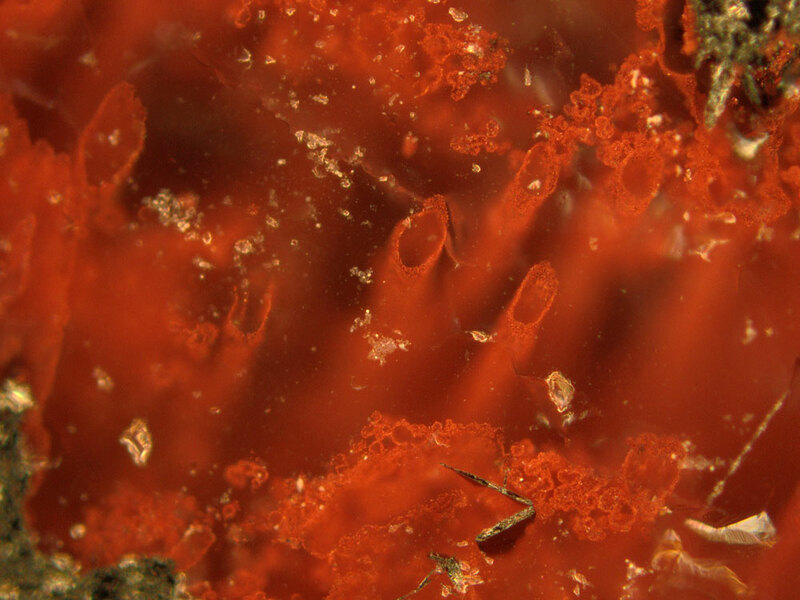 They found that the haematite structures had close similarities with those produced by iron-oxidising bacteria found today by hydrothermal vents and were found alongside graphite and minerals like apatite and carbonates which are frequently associated with fossils. They also found similar spheroid structures to those found in younger fossil-bearing rocks. We found the filaments and tubes inside centimetre-sized structures called concretions or nodules, as well as other tiny spheroidal structures, called rosettes and granules, all of which we think are the products of putrefaction. They are mineralogically identical to those in younger rocks from Norway, the Great Lakes area of North America and Western Australia... The structures are composed of the minerals expected to form from putrefaction, and have been well documented throughout the geological record, from the beginning until today. The fact we unearthed them from one of the oldest known rock formations, suggests we’ve found direct evidence of one of Earth’s oldest life forms. This discovery helps us piece together the history of our planet and the remarkable life on it, and will help to identify traces of life elsewhere in the universe. UCL Earth Sciences and the London Centre for Nanotechnology (quoted in UCL press release). Haematite filament enveloped by a fine irregular layer of nanoscopic haematite from vent deposits in the Nuvvuagittuq Supracrustal Belt in Québec, Canada. 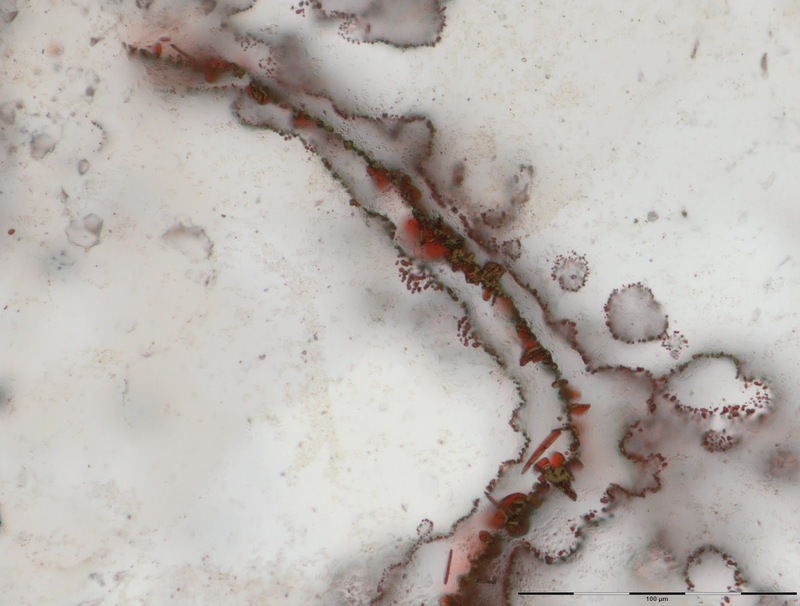 These filaments of iron, about half the size of a human hair, were made by primitive microbes involved in the carbon and iron cycles. This finding is entirely consistent with a ten-step process I included in my latest book, What Makes You So Special? : From the Big Bang to You. Water filtering down into newly–formed rocks around geothermal vents reacted with minerals to produce an alkaline, hydrogen and sulphide rich fluid that welled up in the vents. This fluid reacted with acidic sea water which was then rich in iron to form deposits of highly porous carbonate rock and a foam of iron–sulphur bubbles. Hydrogen and carbon dioxide trapped in these bubbles reacted to make simple organic molecules such as methane, formates and acetates; reactions that would have been catalysed by iron–sulphur compounds. The electrochemical gradient between the alkaline fluid in the pores and the acidic seawater would have provided energy to drive the spontaneous formation of acetyl phosphate and pyrophosphate. These behave like ATP (adenosine triphosphate) which powers modern cells. This power supply would in turn power the formation of amino acids and nucleotides. Currents produced by thermal gradients and diffusion within the porous carbonate rock would have concentrated the larger molecules creating the conditions for building RNA, DNA and proteins and creating the conditions for an evolutionary process where molecules that could catalyse the formation of copies of themselves would quickly dominate and win the struggle for resources. Fatty molecules would have coated the surface of the pores in the rock, enclosing the self–replicating molecules in a primitive cell membrane. Eventually, the formation of the protein catalyst, pyrophosphatase enabled the protocell to extract more energy from the acid–alkaline gradient. This enzyme is still found in some bacteria and archaea. Some protocells would have started using ATP as their primary energy source, especially with the formation of the enzyme ATP synthase. This enzyme is common to all life today. Protocells in locations where the electrochemical gradient was weak could have generated their own gradient by pumping protons across their membrane using the energy released by the reaction between hydrogen and carbon dioxide, so producing a sufficient gradient to power the formation of ATP. The ability to generate their own chemical gradient freed these protocells from dependence on the pores in the rock, so they were now free to become free–living cells. This could have happened at least twice with slightly different cells, one type giving rise to bacteria; the other to archaea. The above ten–step process is of course speculative and probably impossible to test and verify in a laboratory because the conditions around these geothermal vents deep below the ocean would be impossible to replicate in a laboratory, as would the time it might have taken. No–one is claiming it all happened in a day or two, or even weeks or years; not even the lifetime of a working scientist. It could have taken tens or hundreds of millions of years. No–one was in any hurry and there was no objective. Things happened when they happened. What Makes You So Special? : From the Big Bang to You. Field of microscopic filamentous microfossils inside a rounded concretion from the jasper rock in the Nuvvuagittuq Supracrustal Belt in Québec, Canada. The filaments are composed of haematite (red lines), and are located in a quartz layer (white) surrounded by magnetite (black), where both haematite and magnetite are iron oxide minerals. So, it is looking increasingly likely that living systems arose in these ocean-floor conditions by a process broadly similar to that outlined above. Creationists will, of course, reject any such process on the basis that it hasn't been demonstrated in a laboratory and can't be tested, ignoring the fact that none of their claims have any testable evidence nor even a plausible mechanism. For example, no ID advocate has even been able to explain what intelligence can made physics and chemistry do that they can't do without it. What laws of chemistry and/or physics would need to be suspended or changed for two atoms to react or two amino acids to polymerise? But, we can be sure that if science ever does successfully recreate this process in a laboratory, creationists will claim this proves intelligence is required. We can be fairly sure that some paid functionary of a creationist front organisations will even now be working on a prepared misrepresentation of the science, ahead of that dreadful day when their worst nightmare comes true and science closes another God-hosting gap. If they're not, they should be sacked for incompetence, for taking money under false pretences and for breaking their creationist oath.